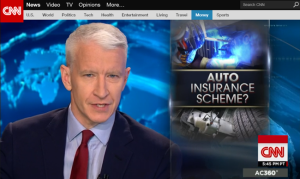 An “Anderson Cooper 360” piece Wednesday night criticized insurers for mandating salvage or aftermarket parts and “steering” customers to corner-cutting body shops. It focuses particularly on the use of salvage and aftermarket parts — probably because they’re more visual — highlighting shoddy ones that in some cases were packaged “like a new part,” in the words of a Monroe, La., shop owner on the show. It ends with Cooper calling the report “unbelievable” and asking what can be done. Griffin urges viewers to check their policies carefully before they get into a crash — he notes earlier that the language about using non-OEM parts is often buried in a policy — and see what the insurers will actually pay for. That’s welcome advice for collision repairers, as it gets the customer aware about what’s going on before they show up in your shop. The piece also talked to Republican Louisiana Attorney General Buddy Caldwell, who has filed a lawsuit against State Farm, the biggest insurer, and Mississippi Attorney General Democrat Jim Hood, who is planning to sue the insurance industry too. Griffin also cites a State Farm legal filing that denies it mandates aftermarket parts. “That’s not true,” Griffin reprimands him. Caldwell condemns the use of unsafe aftermarket and “junkyard” parts, and Hood had choice words for the insurance industry on the show. “They would force a body shop to put junk parts, to weld and patch,” Hood says. If a body shop doesn’t play ball, he said, insurers steer business away and inconvenience them. “They use their economic power to grind down working people,” Hood tells Griffin. The report seemed to target insurers more than aftermarket manufacturers and salvage suppliers, but both industries reacted to their mostly negative depictions on the show. A spokeswoman for the Motor and Equipment Manufacturers Association and its “subsidiary,” Automotive Aftermarket Suppliers Association said she hadn’t seen the piece but neither group would likely have any comment. “The CNN piece leaves car owners under the false impression that aftermarket parts in general are of inferior quality to the original equipment component. There is absolutely no truth to this impression. Non-original equipment parts are as good and often, better than the OE parts they replace. In fact, they are often produced by the same company, but may come in a different box. Companies producing parts in the aftermarket often have the opportunity to correct defects in original equipment parts that are frequently only discovered once the vehicle has been on the road. At the federal level, the show interviewed U.S. Sen. Richard Blumenthal, D-Conn., whom Griffin said has asked the Department of Justice to investigate insurers for using shoddy aftermarket and recycled parts. “I have been concerned for years about it,” Blumenthal, a former Connecticut attorney general, says on the show. Another highlight comes when Griffin and an auto body expert examine a repaired vehicle visually and with a boroscope and find all sorts of problems with the work done, included a ripped tail frame. “This thing is really shaking now,” he says at one point. The steering wheel also begins to shake. The owner said the repair was done at a Progressive-preferred shop, a local Service King, whose manager tells Griffin to leave when he shows up with a camera. Progressive told CNN that the customer chose the shop, not the company. In another interview, the Service King said they did what the insurance company approved. Service King’s corporate office told CNN it wasn’t aware of any complaints. Progressive ultimately declared the car a total loss after the policyholder got an attorney and CNN started investigating, Griffin reported.